The pullup is a difficult exercise that requires you to sustain your entire body while pulling up on a high bar. Though the move is effective for strengthening your lats, rhomboids, trapezius and biceps, accomplishing even one can be challenging. The resistance band helps you to rebound and therefore adds momentum to the upward phase of the exercise. That extra bit of assistance can turn the elusive pullup into an actual achievement. Warm up before practicing pullups with at least 10 minutes of moderate cardiovascular exercise, such as jogging, jumping rope or rowing. Choose a resistance band based on your fitness level. 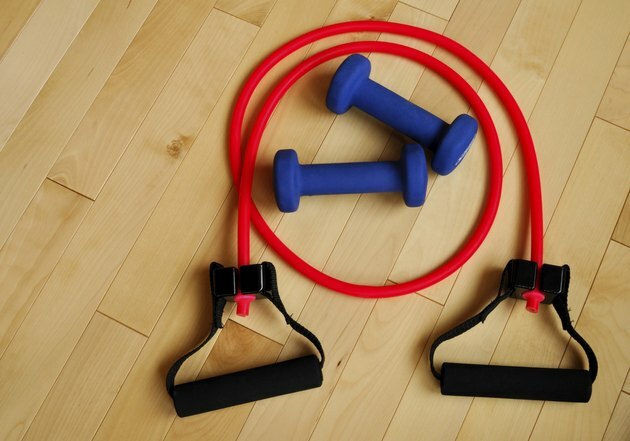 Resistance bands are color-coded in a variety of tensions. Yellow has the least resistance, red and green provide a medium level of resistance and blue and black offer the most resistance. Start with blue or black if you are a beginner. Gradually progress to the lighter resistance bands as you become stronger. Loop both ends of the resistance band around the bar, and tie each in a secure knot. Test the band to make sure it is secure by pulling it down. Place the center of your dominant foot into the bottom of the band. Slightly bend your nonworking leg and cross it behind the dominant leg. Take hold of the pullup bar with an overhand grip, hands separated slightly wider than shoulder width. Stand on a chair or exercise box if you are not able to reach the bar. Slide your shoulder blades down your back and engage your abdominal muscles. Brace your glutes and pelvis so that your body stays stable and rigid throughout the exercise. Pull your chin up toward the bar as your elbows bend and point toward the floor. Aim to have your chin clear the bar. Lower your body gradually, straightening your arms to return to starting position. Use the momentum of the band to immediately perform the next repetitions. Aim to complete five to eight reps. Engage your core to stabilize your body throughout the exercise. Make sure the middle of your foot is securely placed on the bottom of the band to avoid slipping. Wear athletic shoes; the tread can help to grip the band. Avoid performing the exercise in bare feet. Consult with a physician before starting a new or expanding an existing fitness program. Avoid performing pullups if you have any back, shoulder or arm injuries.